When ‘Veep’ premiered in the middle of Barack Obama’s presidency, its brand of dark satire — and its take on narcissism in American political life — seemed at odds with reality. Seven years on, the award-winning HBO comedy — which embarks on its final season, midway through Donald Trump’s first term — seems positively prescient. The sitcom’s wacky storylines of yore are almost charming when compared to the daily barrage of news from the Trump White House. In season seven, the only one shot since Trump took office, bumbling former vice president and president Selina Meyer (Julia Louis-Dreyfus) is once again running for the Oval Office. And her coterie of incompetent staff are back for more crass laughs, profane insults, wildly inappropriate zingers and hilariously meaningless campaign slogans. Meyer is facing a number of primary challengers, including one-time White House staffer and long-time nemesis Jonah Ryan (Timothy Simons), who is just as useless and infinitely more dislikable. The final season almost wasn’t: Louis-Dreyfus, who won six consecutive Emmys for the role and is also a producer of the show, was forced to halt filming for months to battle breast cancer. The 58-year-old actress is back to work. The action in season seven is intensified by the context of Trump’s America: the rise of the bombastic real-life Republican has lent the show an extra shot of venom — and absurdity. Over the years, ‘Veep’ — created by the Scottish writer Armando Iannucci, and taken over in 2015 by showrunner David Mandel — has boasted its fair share of quasi-prophetic moments, including an episode on a government shutdown. At one point, Meyer uses the slogan ‘Continuity with Change,’ which Australian Prime Minister Malcolm Turnbull picked up and used almost verbatim in 2016. On the day of Trump’s shock election in November 2016, Louis-Dreyfus recalls with a touch of alarm a profane line she had to say about the “horror show” of democracy while filming. “The things that the show prided itself on — miscues, missteps, misspeaks, incompetent staff — they are hourly now,” he said. So, how will the new campaign for Meyer — whose political stripes have always been vague, though many believe she resembles former Republican vice presidential candidate Sarah Palin — end? Trailers for the final season are careful not to reveal the outcome, and Meyer’s rapid-fire insults are as cutting as ever, but it appears likely that America will not emerge looking good. In the end, the characters all have weak morals — a far cry from the heroes of the hit series ‘The West Wing’ (1999-2006), which presented the US government as principled and keen to preserve its role in the world. Even Netflix’s dark ‘House of Cards’ (2013-2018) featured an eloquent-if-ruthless president, with a few higher-minded motives. ‘Veep’ drops any semblance of patriotism or pageantry, instead depicting politics at its most coarse and cynical. The actors stress that ‘Veep’ parodies a universal political cynicism and egotism, but as real-life politics more closely resembles its satire, they say it’s time for the curtain to fall. “The things that would have torpedoed a political career just do not count anymore,” Simons told journalists. 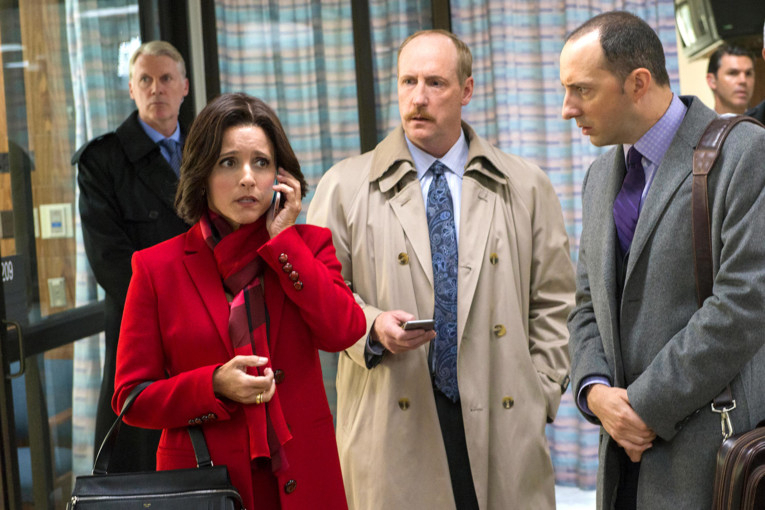 The final season of ‘Veep’ airs in the UAE on Mondays at 10pm on OSN Series First and streams on OSN Play.